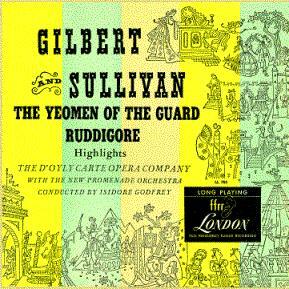 This recording's position, as the seventh issued in D'Oyly Carte's post-war series (ahead of even Iolanthe and Patience), says mountains about Ruddigore's progress from a failed opera in Gilbert's day to one of the more popular among the G&S die-hards who were the Company's core audience. 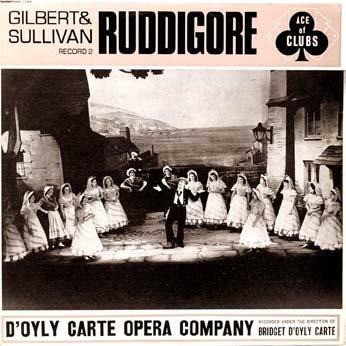 Only two D'Oyly Carte baritones recorded Robin Oakapple: Martyn Green and John Reed. Of the two, Green sounds far more like the young but shy farmer Gilbert's libretto demands. The recording is marred by Ann Drummond-Grant's Mad Margaret. Drummond-Grant played soubrette roles on several recordings of this period, but she never played them on stage. She was a soprano earlier in her career, but by this time was playing contralto parts. The only explanation for her singing mezzo parts in these studio recordings was her status as Mrs. Isidore Godfrey. The stanza "This sport he much enjoyed" from Dame Hannah's "Sir Rupert Murgatroyd." The duet for Rose and Richard, "The battle's roar is over." The second verse of "Happily coupled are we." Robin's Act II recitative and patter song, "Away remorse." The original finale, which is replaced by a reprise of "Oh, happy the lily," with an abbreviated version of the dance from that published. I never was much of a Leonard Osborn fan, but this truly was his finest role. He sounded fantastic, probably because most of Act I doesn't lie to high for his voice. His entrance song especially sits right in the meaty part of his voice. 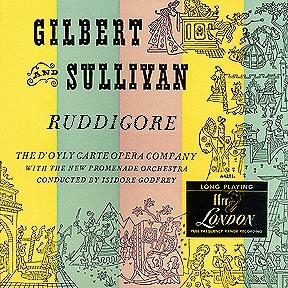 Strangely enough, after listening to Ruddigore and going back to listen to some of his other recordings, they seemed to take on a new life, and I enjoyed them much more. I guess once you hear someone at their best, you can appreciate all of their work and listen for glimpses of what you admire about them. As long as I know someone is capable of quality singing, I'll cut them some slack. 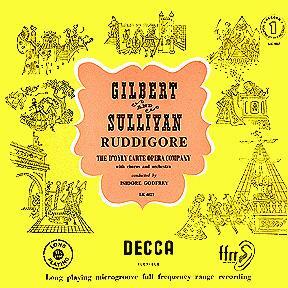 The same thing has happened with me, but I often have to listen to Ruddigore just before I listen to many of his other recordings to get back into a favourable frame of mind for some of the poor sound that I know is soon to come. However, there is a certain theatricality that even his poor singing is able to overcome. I once asked a devoted follower of the DC from the 20s onwards what she thought about Osborn. Her eyes misted over as she said 'Dear Leonard, he was marvellous'. This was not a collector of the recordings, and when I commented on the poorness of his recorded voice she said this was not something she had noticed in live performances. To her, and to a couple of other old dears who joined the conversation, 'Dear Leonard' was more charismatic a performer than Derek Oldham. Ah, a fellow Osborn fan! I have always liked his work, even when he sang badly. But his Dauntless was the best I have ever heard, and I had the pleasure of seeing him and meeting him when the D'OC did Iolanthe in New York in the early or mid fifties. He had an exuberance and a sort of rugged masculinity that was so far opposed to the typical tenor sweeetness of DOC's leading men. Much as I have always enjoyed Oldham, he was just too non-testicular in certain roles, even though he sang with elegance and taste. I don't think anybody who knows Osborn only from his recordings has much of a good word to say for him, but I understand he had a tremendous charisma in the theatre, and much of the quality of his performance was visual not vocal. He had all the tenage girls swooning over him, I am told. I remember many years ago, asking a then prominent member of the London Gilbert & Sullivan Society, Jeanne Giffin, what it was about Osborn, and she replied "When, as Cyril, he sang 'Oh kiss me, kiss me…' he had no need to say it more than once". 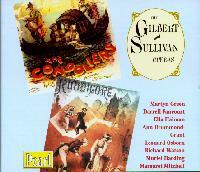 Note that the Pearl Ruddigore is only available as part of a three CD set which also includes the 1950 Gondoliers. 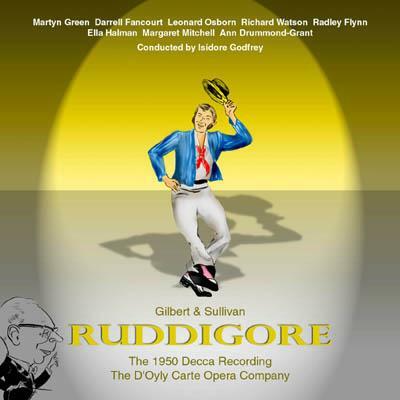 According to the producer, the listener would appreciate their having the seperate acts on different CDs — so Act Two of Ruddigore comes before Act One!! I found this very annoying. I would not have minded Act One being split onto the third disc. Although both CDs offer quite extensive technical notes, it is Jim Craig who writes the more in-depth details regarding all the recording and transfer problems of the time. To hear what sort of problems are faced by the producers, one should start with the "Painted Emblems" section from Act 2. Not only do the originals have fiendish distortion, especially with the timpani, but there are several editing 'joins' which must be ironed out. My respect for Chris Webster has increased ten-fold here. Here his editing is a work of art and the hours he must have spent splicing bits together has given us a magnificent result. The whole sequence flows and is really spectacular. When I first sat down to do the comparison I listened to the first six or seven numbers of the Pearl recording making notes and then listened to the same numbers again from the SOCD recording. The interesting thing was that I hardly wrote much while listening to the SOCD recording. From the outset of the Overture you will find that the Pearl version has been recorded flat. There is lots of middle and no bass or treble. On the SOCD version the seperation is excellent. The bass really jumps out at you during the second verse of "Ghosts High Noon" in the Overture. The Pearl recording did nothing to get rid of the annoying triangle in the opening chorus. I think the player must have raced up to the microphone each time he was on! Chris managed to send him to the back row where he belongs. There are still hints of pre-echo throughout both versions but never as much as the Pinafore in the series. It was most annoying during "If somebody chanced to be" but is soon forgotten when we can get to hear the magnificent voice of Margaret Mitchell. Distortion plagues the Pearl recording but is almost completely absent from the SOCD version. Perhaps the worst item recorded is the "Shipped D'ye see" section. The second verse has rumbles and hiccups that would be a major problem for any editor. I prefer the Pearl version of this. Kept flat, this gives the voice a brighter spark than Chris seems to obtain — although I can tell he had many a sleepless night over this particular track. One artist that really benefits from the SOCD recording is Ann Drummond-Grant (Mad Margaret) whose Act One scene is certainly one of the best recordings I have ever heard. In the Pearl version the Woodwind almost disappears. In the SOCD version it jumps out at you — one can now actually hear the bassoon! This is one of the main advantages of the SOCD version in that it manages to do justice to the artists that would otherwise be overlooked. Take for example the "As pure and blameless peasant" section in the Finale to Act One. You can actually hear the change in Martyn Green's voice as he takes on his new role as the bad Baronet. There is an interesting change at the opening of Act Two on the Pearl version. Whether it comes from a different source or what but the distortion disappears and we have some really clean orchestral sounds. Anyhow its two thumbs up for the SOCD recording. With the Pearl its like receiving a visit from an old friend. With the SOCD recording its like receiving a visit from an old friend who has recently purchased some new clothes. Album LGF-42 Automatic side couplings. Published in one volume of nine discs. 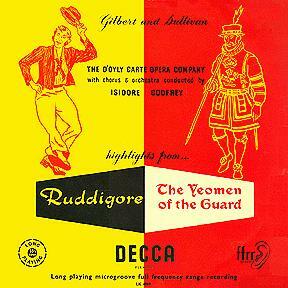 1953 Decca Mono LP LK 4069 Ruddigore and Yeomen highlights. Note that LKA 4069 was an Australian issue.